It started snowing quite heavily on Sunday night in London, very unusual for February. Monday morning dawns and London is blanketed with about a foot of snow. 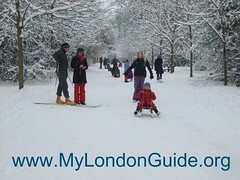 As most people did not have to work today, 6 million Londoners were left to play in the snow. Here are some scenes from around London.